I always find it strange when authors pick a place, such as Michigan, for the home of a god (or other larger than life type of character). A tethered spot for the underworld. I guess it has to be somewhere, but it just strikes me strange when that kind of thing happens. Kate’s whole life prior to chapter one takes place in New York City and I wish we got to see more of that, since it does have a place in her dreams and in her memories. All we really see is Central Park though. I also love wide open country, and I wish she would have described it more, and how it made the character feel. The house, Eden Manor, I just couldn’t picture it. The author only really describes it in detail when Kate first goes there. And I couldn’t get over the sense of gaudy, ornate, over-done-ness that some rich person would do to their house to make people really really KNOW that they are super rich. I didn’t get a sense of tasteful decor, and it influenced my opinion of the other characters before I had even met them. Kate is the main character. She comes to find out that she has a choice to make, and it is a selfish one if you ask me, but she makes it and I’m not sure if I would’ve done differently. I did like this book, so I gave it 3.5 stars, because I wasn’t completely neutral about it. The problem was in the writing. It just needed more work. It kind of reminded me of when I write something, and then go over it once or twice. A fantastic piece of fiction should be worked on, really thought about. So even though the story is interesting enough, even if it is far-fetched (hey, it’s supernatural YA fiction and I love it), I had a hard time getting past the sketchy writing. It isn’t horrible, it is cliché. It is derivative. It is not original, and a lot of times the author does this thing that in my mind I call a cop-out. Where she zooms out and just tells us what happens, instead of taking us into moments. She skips long periods of time and just gives an overview. Maybe the book just wouldn’t have been interesting, and maybe it would have slowed it way down to give more detail, but a good author wouldn’t have had that problem. Still, I will read the next book. 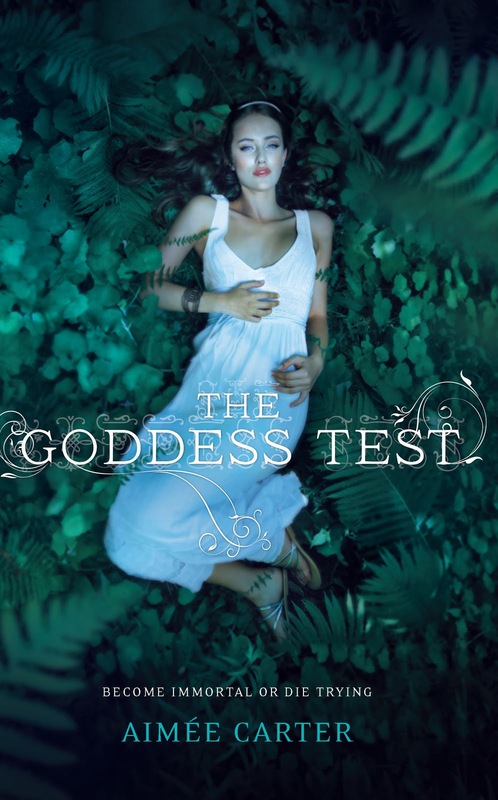 I will not read this one again, although if you like mythology, I would recommend. If you are just a fan of YA fiction, I would say read at your own risk. Whether or not you will like it depends on how much you pay attention to the writing and tiny annoying things that don’t really make sense but are completely ignorable. I got hung up in the middle, but after I passed the swell of kind of boring things in the middle, I got back into it and finished the last, oh I don’t know half to third, in one sitting. The cover is beautiful, although the expression of the model is really strange. She is so beautiful, but it looks like she fell down, and just. can’t. get. up. And doesn’t really care about anything. I love the earthiness and all the green around her. Makes me long for summer. One thing that drove me the heck crazy was the Conflicting Ornate Things. The embellishments on the font are beautiful. The cover has a texture on it that is really cool, almost like Victorian wallpaper, but subtle. The chapter headings have little designs that, by themselves, would be interesting and pretty. My problem is that they all clash with each other. Drove me nuts every time I picked up the book. It would have been better if I had read this as an ebook. Here’s a link to the author’s twitter. She’s pretty active on there, so follow her and while you’re at it, follow us too!